FC Series OEM Fiber Solutions - G & W Machinery Sales, Inc.
FC OEM Series Fiber Laser SystemVytek -- a world leader in laser marking and laser cutting systems -- is pleased to offer a range of OEM fiber laser packages for both the OEM and integrator that allow us to easily customize solutions for any environment. The Vytek FC OEM fiber laser series is a lightweight and self-contained laser solution for integrators and OEMs that require a compact, yet full featured, laser package for direct part marking. The FC series offers unprecedented flexibility for small to extremely large parts that need to be marked in place or as part of a production line. The FC OEM series offers all of the features and capabilities of our full laser marking systems but with the flexibility of a remote compact head assembly. 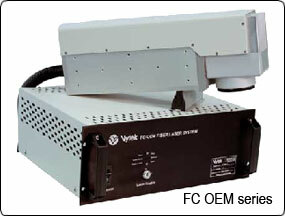 The laser and the control are housed in a rack mount enclosure and are designed to work in industrial environments. The remote head/galvo assembly are enclosed in a mono-block machined assembly allowing mounting at any angle including inverted or upside down. 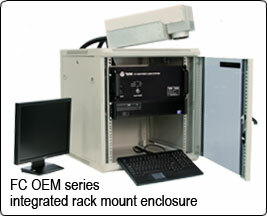 FC OEM Fiber Laser System Integrated Rack MountAll critical wiring to the remote head is strain-relieved and housed in a flexible but rigid wire wrap enclosure that prevents crushing and also keeps dirt and dust from getting to the wiring. The control cabinet offers full access at its rear. The communications, I/O and safety circuits for interlock are also easily accessible. The FC OEM is offered in several formats and can be configured with an integrated rack mount enclosure that houses the PC, laser, keyboard and mouse to allow the user an easy and quick start format for integration into any production environment. The FC series is offered in both pulsed and CW fiber laser formats from 10 to 200 watts for just about any laser marking requirement. The FC series is the ideal laser marking solution when you need to be ready for a wide range of marking requirements and easy integration into your factory environment.